The Journal of Appalachian Health is an online, open access, peer-reviewed journal with a mission of creating a healthy and thriving Appalachia. Thanks to support from the Robert Wood Johnson Foundation, the Journal requires no subscription or author publication fee. The Journal is particularly interested in submissions that focus on Appalachian health inequities and social determinants of health. If you are interested in submitting articles for publication, you can view the instructions for authors and further description of the Journal at https://uknowledge.uky.edu/jah/. To sign up for your free copy of the Journal, go to our website at https://uknowledge.uky.edu/jah/ or send an email to AppalachHealth@UKy.edu to be added to the Journal mailing list. For more information, view the press release. Affiliate faculty appointments may be considered for individuals who, by virtue of their expertise, are deemed capable of making a significant contribution to the CPHP program. Such contribution may involve collaboration on grants, giving occasional lectures, or acting as preceptor to students during field work or practicum. Affiliate faculty appointments may be made available to faculty who hold primary appointments in departments or Centers of Pitt Public Health or other schools of the University, or to persons who hold University and academic professional positions in the University. The ELI team incorporated extensive stakeholder feedback into a user-centered design for the Emergency Law Inventory. This collaborative partnership was a value add to the process and the end result. The Emergency Law Inventory was used to examine and analyze state employment benefit laws pertaining to emergency response volunteers. Analyses of the laws revealed that fewer than half of the jurisdictions have laws that protect seniority, vacation time, sick time, or overtime privileges. Additionally, there is tremendous variance and lack of uniformity among the jurisdictions concerning employment status requirements, geographic constraints, time limitations, and economic impacts. “Something has to change, because what we’re currently doing to stop the opioid epidemic clearly isn’t enough.” Wendy E. Braund, MD, MPH, MSEd, FACPM, director of the Center for Public Health Practice, recently shared her thoughts on how harm reduction can and should be used to help address the opioid epidemic. 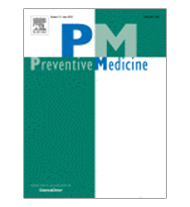 Wendy E. Braund, MD, MPH, MSEd, FACPM, director of the Center for Public Health Practice, recently co-authored “Preventive Medicine: A hidden asset for building a dominant culture of prevention” in the journal Preventive Medicine. Braund, along with Stephanie Zaza, MD, MPH, FACPM of the U.S. Public Health Service (retired) and Robert W. Carr, MD, MPH of the Georgetown University School of Medicine, explore the critical role of preventive medicine in the U.S. health care ecosystem and encourage their colleagues to help create a culture of prevention. To read the article, click on the link below: Zaza S, Braund WE, Carr RW. Each year the University of Pittsburgh Innovation Institute hosts the Celebration of Innovation to present Innovator Awards recognizing University of Pittsburgh faculty and students who had their discoveries licensed or optioned from the University. In 2017, Elizabeth Van Nostrand, JD, received an Innovator Award for one of her inventions. The University of Pittsburgh is in the process of taking that invention, Legal Triage, to market. Legal Triage will help individuals navigate through thousands of legal summaries. Identifying legal issues and accessing laws can be difficult, even for lawyers. Legal Triage will remove these barriers and give users clear, concise summaries of law. The Center for Public Health Practice is pleased to announce the 2017 Bernard D. Goldstein Student Award in Environmental Health Disparities and in Public Health Practice recipient, Ms. Alix Ware. 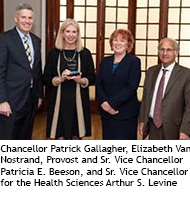 The Bernard D. Goldstein Award was established in 2005 by Dr. Bernard Goldstein, then dean of Pitt Public Health and a professor in Environmental and Occupational Health, and his wife, Russellyn Carruth, an adjunct professor in Environmental and Occupational Health. The award was established for students or postdoctoral fellows at Pitt Public Health and is given alternately in one of two areas Environmental Health Disparities or Public Health Practice. The award is available annually to eligible students through a competitive application process. Alix Ware, a Master of Public Health student in the Department of Health Policy and Management and a JD student at the School of Law, earned the Bernard D. Goldstein Award for her work with the Emergency Law Inventory (ELI). ELI was created to help individuals navigate through 1,500 law summaries impacting volunteer participation in disaster scenarios. Ms. Ware’s work on the development of ELI helped provide emergency volunteers with easy access to the laws most relevant to them, enabling them to feel more prepared for their role in an emergency response. The Center for Public Health Practice’s Tina Batra Hershey, JD, MPH and Elizabeth Van Nostrand, JD recently contributed their legal expertise to several Washington Post articles about opioids. PA WalkWorks has implemented a new web-based tool for tracking physical activity. Walker Tracker grants users an opportunity to set personal goals for daily activity, connect with other people in their area, and create or join activity challenges. In addition to utilizing it online, Walker Tracker may be used via its mobile app on both iPhones and Androids. Steps can be manually entered or users will be able to synchronize their daily activities directly from fitness devices such as FitBit, Garmin, Jawbone, Apple Health, and Google Fit. Other forms of physical activity, such as swimming or biking–even yoga, can be converted into steps! Registration for Walker Tracker is available on the PA WalkWorks website or by visiting pawalkworks.walkertracker.com. The Center for Public Health Practice welcomes Wendy E. Braund, MD, MPH, MSEd, FACPM as its new director and Associate Dean for Public Health Practice! Dr. Braund comes to the University of Pittsburgh from the Wyoming Department of Health, where since 2011 she has served as state health officer and public health division administrator handling policy, strategy, and administration of public health programs. Prior to that she was at the U.S. Department of Health and Human Services for over four years, most recently at the Health Resources and Services Administration (HRSA), where she served as chief of the Public Health Branch, and acting chief of the Geriatrics and Allied Health Branch, within the Division of Public Health and Interdisciplinary Education, Bureau of Health Professions. Dr. Braund holds an MD from the Pennsylvania State University College of Medicine and completed a residency in preventive medicine at Johns Hopkins. She holds an MPH from the Johns Hopkins Bloomberg School of Public Health. She has also earned degrees from the University of Pennsylvania and Duke University, and has completed the executive education program for state health leaders at the Harvard Kennedy School of Government. She is a leader in public health practice and preventive medicine on a national stage, serving on the Board of Regents of the American College of Preventive Medicine, as a trustee of the American Board of Preventive Medicine, and as a representative to the American Medical Association Section Council on Preventive Medicine among other appointments. Since 2013, she has served as a site reviewer for the Council on Education for Public Health. She previously served as HRSA representative on the Council on Linkages Between Academia and Public Health Practice and as an associate in the Department of Health Policy and Management at Johns Hopkins. A dynamic and innovative practitioner with extensive experience in public service and policy, Dr. Braund will craft and lead a strategic vision for the Center’s future. She will continue to build regional collaborations to improve population health, and expand our public health practice-based teaching, research, and service in the expanded arena of hospitals and health systems. The Center for Public Health Practice’s Tina Batra Hershey, JD, MPH and Health Policy and Management’s Jeremy M. Kahn, MD, MS recently had an editorial published in the New England Journal of Medicine on state sepsis mandates requiring hospitals to follow a protocol to quickly identify and treat sepsis. The authors examine the potential of additional state sepsis mandates, noting this represented a major shift in the use of health policy to improve the quality of health care, rather than using market-based incentives and reimbursement penalties.